Senior negotiator Erekat steps down over Al-Jazeera leaks scandal. The Palestinian Authority's top negotiator, Saeb Erekat, resigned Saturday over the Al-Jazeera leaks scandal, in which the popular Arab station Al-Jazeera published documents that purportedly showed that the PA had agreed to several concessions during talks with Israel. The PA has denied the validity of the documents and says it never agreed to compromise on issues such as control of Jerusalem and the Arab demand that the descendants of Arabs who fled pre-state Israel be allowed in Israel. Erekat continued to deny that the documents were accurate while announcing his resignation. He said he was assuming responsibility for “the theft of documents,” but that the documents had been tampered with before they were published. Hamas expressed satisfaction with Erekat's resignation, and claimed that it proved that the Al-Jazeera documents were accurate. When the documents were first published, Erekat accused Al-Jazeera of trying to “bring down the Palestinian political system” by provoking a revolution. A senior Israeli analyst suggested Erekat may have been correct. Al-Jazeera has an agenda to de-legitimize the PA, said Pinhas Inbari. The result of the report would be to leave the PA without the support to declare statehood, but also unable to make concessions to Israel and thus unable to negotiate, he said. 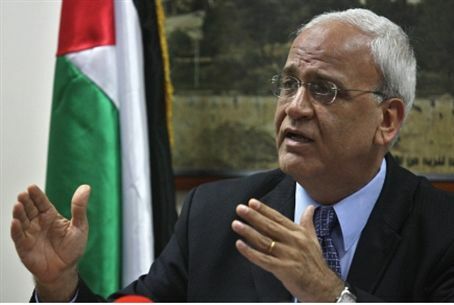 Erekat had also accused Israel and the United States of being behind the Al-Jazeera report. In addition, he accused Qatar, the home of Al-Jazeera, of investing in Jewish communities. Erekat's commitment to negotiations with Israel has been called into question in recent months over his insistence on the Arab “right of return,” and his praise for a PA terrorist who murdered an Israeli minister.